Spanish siete ‘seven’ derives from Latin septem and here the derivation is perfectly regular and goes as expected: a short stressed ĕ changes to ie, a syllable-final p is dropped, and the final m is dropped as well, as always (cf. September). English seven /ˈsɛ.vən/ doesn’t resemble siete quite enough to look like an obvious patrimonial cognate. Nonetheless, the two are indeed cognates. English seven comes from Proto-Germanic *sebun, from Proto-Indo-European *septḿ̥, the ancestor of Lat. septem, cf. Ancient Greek ἑπτά ‎(hepta) and Old English seofon. The Latin root sĕpt‑ of the number can be found in a number of Spanish words, such as the learned ordinal adjective séptimo/a ‘seventh’ (cf. §19.15). This adjective is a learned loanword from Latin, though it is first attested in the 13th century. The root sĕpt‑ is also found in the name of the month se(p)tiembre, for example (cf. Chapter 21). Additionally, Spanish has a learned word septentrión that translates into English as north, the compass point or cardinal direction, and is, thus, a synonym of Sp. norte (a Germanic loanword). Actually, this word had an English cognate, septentrion, also meaning ‘the north or northern regions’, which is now obsolete. These word septentrion comes from Lat. (acc.) septentriōnem (nominative: septentriō), lit. ‘(the) seven plow oxen’, a Roman name for the seven stars of the Big Dipper (UK Eng. The Plough; Sp. El Carro) asterism (star pattern) which form the tail and part of the body of the Ursa Major constellation (Sp. Osa Mayor) near the pole star (also known as North Star or Polaris; Sp. estrella polar). The word is derived from a phrase formed by the words septem ‘even’ and triō ‘plow ox’ (regular root: triōn‑). Much more common than the noun septentrión in Spanish is the derived adjective septentrional, meaning ‘northern’, as in las regions septentrionales de la península ‘the northern regions of the peninsula’. This word contrasts with its opposite, meridional, meaning ‘southern’, which comes from Latin merīdiōnālis, an adjective derived from merīdiēs ‘noon; south’, from an earlier *medīdiēs, a compound from medius ‘middle’ and diēs ‘day’. Lat. merīdiēs is part of the English abbreviations a.m. and p.m., which stand for ante merīdiem ‘before noon’ and post merīdiem ‘after noon’ (merīdiem is the accusative case form of merīdiēs). Another Spanish word that descends from one that that contains the root sept‑ is semana ‘week’ (seman-a; Old Sp. setmana). This word descends from Late Latin noun sĕptĭmāna, also meaning ‘week’, which is derived derived from the Latin adjective sĕptĭmāna (sept‑ĭm‑ān‑a; masc. sĕptĭmānus) ‘related to the seventh element of a series’, which is derived from the adjective sĕptĭmus/sĕptĭma ‘seventh’ (cf. Sp. séptimo/a; ). Derived from the noun semana are the adjective semanal ‘weekly’ (seman-al) and the noun semanario ‘weekly magazine/newspaper’ (seman‑ari‑o; the suffix ‑ari‑(o) is a borrowing from Latin ‑ari‑(us) and a doublet of the Spanish suffix ‑er‑(o)). English has no words containing the Latin stem sĕptĭman‑ and thus has no cognates of any of these words. Finally, we should note that, as mentioned earlier, Lat. sĕptem is cognate with Ancient Greek ἑπτά (heptá) ‘seven’, since they both come from Proto-Indo-European *septḿ̥ (as in the case of the Ancient Greek word for ‘six’, we detect here too that Proto-Indo-European word-initial *s changed to h, glottal aspiration, in Greek). The Greek word ἑπτά (heptá) can be found in some Spanish-English cognates, such as Eng. heptagon ~ Sp. heptágono (‘a polygon having seven sides’, AHD) and Eng. heptathlon ~ Sp. heptatlón (‘an athletic contest for women that consists of seven separate events’, COED). The former cognates go back to Latin heptagōnum, from Greek ἑπτάγωνον (heptagōnon), neuter form of of the adjective ἑπτάγωνος heptagōnos ‘seven-cornered’, a word formed with this numeral and the word γωνία (gōnía) ‘corner, angle’ (which is related to the word γόνῠ (gónu) ‘knee’, which is a cognate of the English word knee and Latin genū ‘knee’). The second set of cognates, on the other hand, are a 1970s’ New Latin creation out of Ancient Greek parts to refer to a type of athletic competition. The north star is the brightest star in the Ursa Minor constellation, at the end of the handle of the Little Dipper, which is right above the Big Dipper. 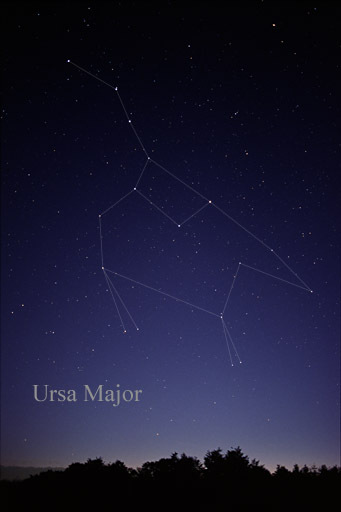 Ursa Major means ‘big bear’ in Latin and Ursa Minor ‘little bear’. The names come from ancient mythology. Latin calqued them from Greek, e.g. Ἄρκτος μεγάλη (Arktos Megale) ‘big bear’, from Gk. ἄρκτος (árktos) ‘bear’. Derived from this Greek noun was the adjective ἀρκτικός (arktikós), literally ‘of the bear’, but which came to mean ‘northern’. This adjective was borrowed by Latin as arctĭcus, the source of Eng. arctic and Sp. ártico. English got the word from Old French artique in the late 14th century, by which time the medial c had been lost, but English reintroduced it in the mid-16th century, though it is not necessarily pronounced. Note that the Spanish word has no c in it. By the late 16th century, the word was already used to refer to the region around the north pole of the earth and now the proper noun Arctic names ‘a region between the North Pole and the northern timberlines of North America and Eurasia’ (AHD; Sp. el Ártico). Another traditional, fancy adjective for the cardinal direction north is Eng. boreal ~ Sp. boreal ‘northern’. These words are loanwords from Late Lat. boreālis, an adjective derived from Lat. borĕas ‘north wind’, a loanword from Gk. βορέας (boreas) ‘north wind’, which was the name (of unknown origin) of the god of the north wind in Greek mythology. The source noun also exist in English and Spanish as a fancy literary name for the north wind: Eng. boreas [ˈbɔɹ.ɪ.æs] ~ Sp. bóreas [ˈbo.ɾe.as]. The word for ‘knee’ in Vulgar and Late Latin was *genicŭlum, which is a diminutive of Latin genū. This V.Lat. genicŭlum has given us Modern Spanish hinojo, an old-fashioned word for ‘knee’, a word that pretty much only survives in the idiomatic and uncommon expression de hinojos (= de rodillas) ‘on one’s knees’. The regular Modern Spanish word for ‘knee’, rodilla, comes from Late Latin rotella, diminutive of Latin rota ‘wheel’, the source of patrimonial Sp. rueda ‘wheel’.